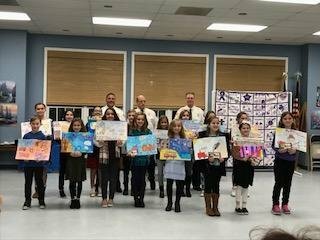 Frisbie fourth and fifth grade students won the 2017 Five Prevention Poster Contest. The students receiving the award were: Dylan Chicano, Medina Cirikovic, Ava Gugliotti, Julia Perugini, Isabel Puffer, Camryn Rader, Giavanna Crea, Olivia D'Alessio, Melanie Lanza and Sara-Kate Lumia. Congratulations!